To find out more about Aldeburgh see the Visit Alderburgh website. Thorpeness was created by the Scottish playwright Glencairn Stuart Ogilvie during the Edwardian period. Ogilvie decided to create Thorpeness as a private place to stay for his friends and family to holiday during the summer. Works on creating Thorpeness began in 1910 and the beautiful Tudor and Jacobean style homes we see today began to take form alongside the golf course and country club. Thorpeness remained largely in the ownership of the Ogilvie family until 1972 when most of it was sold. 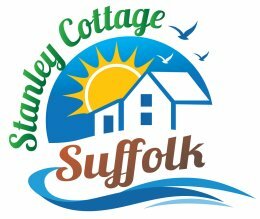 Thorpeness is approximately a mile north of Aldeburgh & 3 miles from Stanley Cottage. As well as its unique features it is also a great place for walking, cycling and birdwatching with the location being surrounded by heathland, marshland and a shingle beach. There is also a fantastic large boating lake to enjoy. To find out more about Thorpeness see the Thorpeness entry in this Guide To The Suffolk Coast.